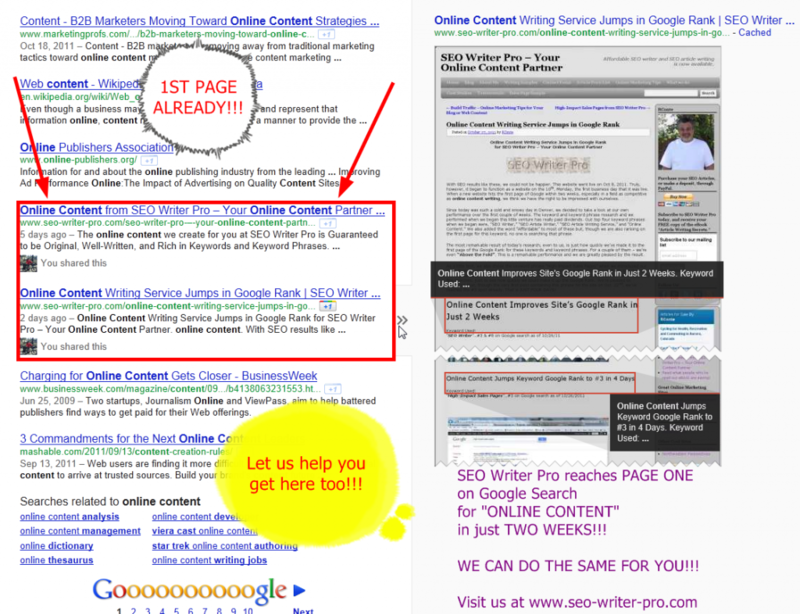 With SEO results like these, we could not be happier. This website went live on Oct 8, 2011. Truly, however, it began to function as a website on the 10th, Monday, the first business day that it was live. 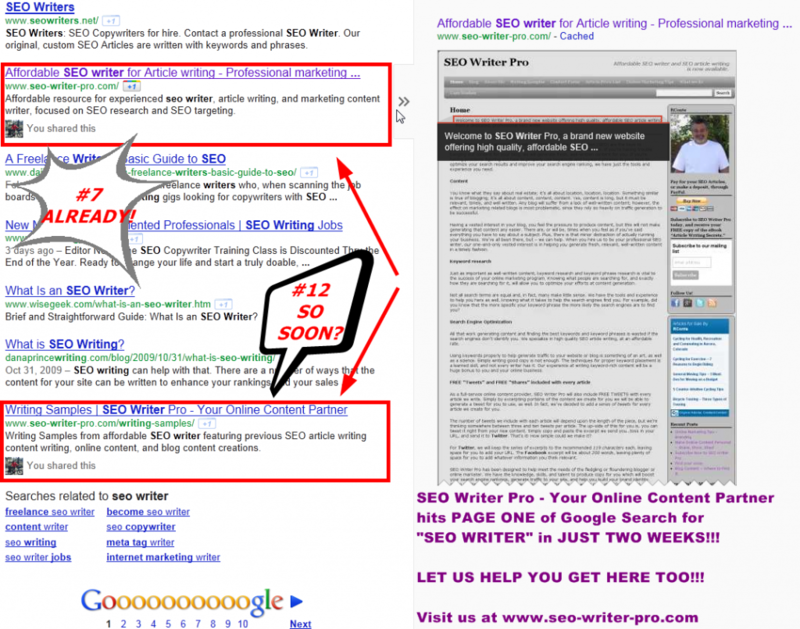 When a new website hits the first page of Google within two weeks, especially in a field as competitive as online content writing, we think we have the right to be impressed with ourselves. Since today was such a cold and snowy day in Denver, we decided to take a look at our own performance over the first couple of weeks. The keyword and keyword phrase research we performed when we began this little venture has really paid dividends. 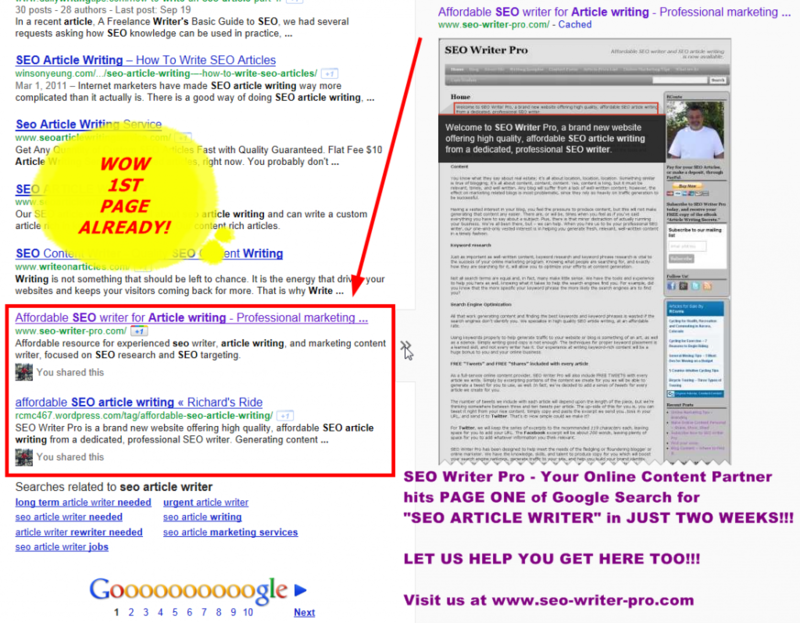 Out top four keyword phrases when we began were, “SEO Writer,” “SEO Article Writer,” “SEO Article Writing Service,” and “Online Content.” We also added the word “Affordable” to most of these but, though we are also ranking on the first page for this keyword, no one is searching that phrase. The most remarkable result of today’s research, even to us, is just how quickly we’ve made it to the first page of the Google Rank for these keywords and keyword phrases. For a couple of them – we’re even “Above the Fold”. This is a remarkable performance and we are greatly pleased by the result. 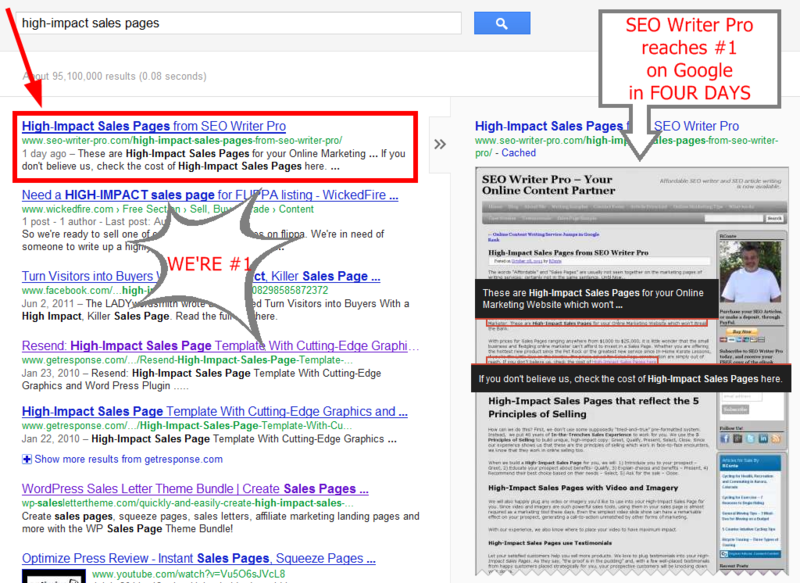 As a little test, we also chose the keyword phrase “High-Impact Sales Pages” when we introduced our Sales Page service. Now, the keyword phrase “Sales Pages” has a very high Google Rank, but it also has a great deal of competition, naturally. So, to test our SEO skills, we chose a phrase which has very few searches, just to see how quickly we could make it up the Google Rank. We’re pleased to announce that, though the very first post containing this phrase hit the site on Oct. 22nd, we’ve reached the #3 spot already. That is JUST FOUR DAYS! UPDATE…As of Oct. 29th, we made the move to #1 on Google!!! The point of all this backslapping action is, of course, to prove that we know what we’re doing, and that we can do it for you, as well. 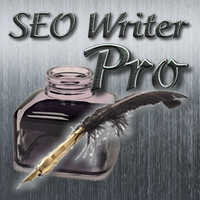 With our keyword and keyword phrase research, SEO article writing service, and our high quality online content writing, we may be able to help you climb the Google Rank ladder just as quickly. For more information, or to ask for a Project Quote, please use our handy-dandy Contact Form. 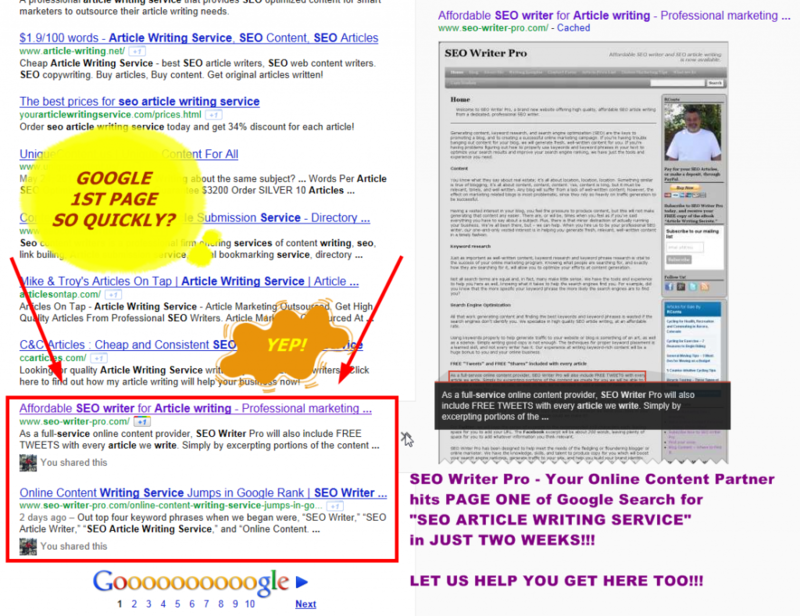 This entry was posted in Blog content, Content writing, Online Content, SEO Writer and tagged affordable seo articles, affordable seo writer, blog content writer, content, online content writer, online content writing services, SEO Writer, seo writing, writing services. Bookmark the permalink.